The beautiful, elliptical St Cecilia's Hall dates back to 1763, making it the oldest purpose-built concert hall in Scotland. 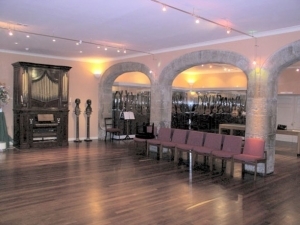 Designed by Robert Mylne for the Edinburgh Musical Society, St Cecilia's Hall is now home to the University of Edinburgh's collection of keyboard instruments. This Edinburgh First venue provides a stunning setting for all manner of events, in particular musical performances, recitals, conferences and other special occasions. Sorry, but we have no upcoming events for St Cecilias Hall. If you know of an event taking place at St Cecilias Hall or anywhere else in Edinburgh tell us about it and we'll list it on the website, for free!